With only few days left before Christmas, Filipinos are getting more ecstatic to count the remaining days towards December 25. With this, SM Malls in Baliwag and Pulilan officially began the holiday surprise with the launch of their iconic centerpieces. SM City Baliwag welcome Christmas with a nostalgic 24 feet high and 21 feet wide Christmas tree with the theme little drummer boy, a popular Christmas character in every children’s books. The grand centerpiece is a dream come true as families get to admire the gigantic Christmas tree reimagined through a four layer, uniquely crafted gigantic drums made of wood, 26 pieces life-size little drummer figures made of fiber resin, and giant gift boxes. The unveiling drew cheers from the crowd, as the Mall Atrium became a music hall filled with classic Christmas chants making shoppers feel more like Christmas. Moreover, the centerpiece reminds everyone of Jesus as the center of Christmas through the story of a little drummer boy, a fictitious character who offered to play the drums for the young Jesus, and as he play, Jesus smiles. Gracing the Christmas Launch was actor Kristoffer Martin giving audience full blown entertainment as he serenade them to the beat of classic song “Santa Clause is coming to town”. Apart from the launching of their centerpiece, gift giving of Bears of Joy to the children of Baliwag also highlighted the program. SM encourages shoppers to put a smile on children’s faces by purchasing the SM Care Bears of Joy for only P200. Shoppers get to keep one bear and donate another while proceeds together with the bears will be donated to charitable institutions nationwide. 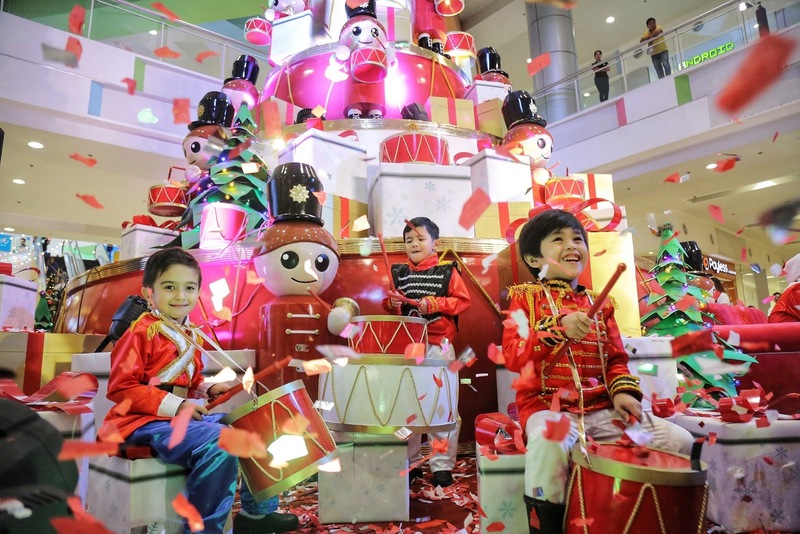 Meanwhile, SM Center Pulilan unveiled a grand centerpiece that brings back childhood memories—a dreamy 25 feet tall and 19 feet diameter tower made of Toy Blocks and Christmas Bears of Joy. With a theme Fun-Toys-Tic Christmas, the centerpiece was made of playful colors and elements of fun with toy blocks designed with letter and fancy Christmas icons. The rest of the night was made unforgettable as WCOPA winner Cha-cha Cañete enticed the crowd with a song and dance number.